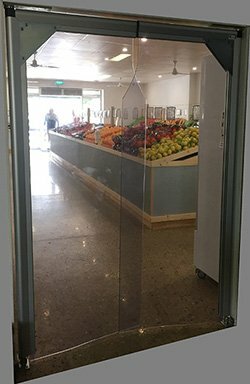 These aluminium-framed, Clear Plastic Swing Doors or Clear PVC Swing Doors are ideal for many industrial and commercial door applications including Factories, Kitchens, Food Processing Plants, Transport Terminals, Retail Stores, Supermarkets, Cold Storage and Hospitals, etc. With their self-closing dual swing action, they are an asset in applications such as; keeping out drafts, dust, pests and continue to provide outstanding results in new applications using their safety, hygiene, temperature and noise reducing properties. Ideal in applications for; personnel traffic, these doors will provide a low maintenance solution in a Medium Duty traffic situation. 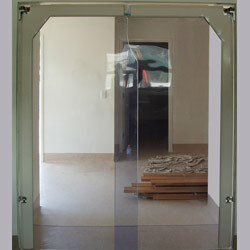 For Heavy Duty PVC Swing Door applications i.e. Fork Lift, Pallet Trolley traffic. 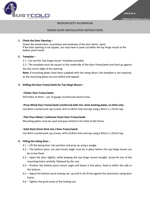 We recommend installing our steel framed Heavy Duty Swing Doors. The Clear PVC Plastic sheets can be replaced. Austcold Industries has two thicknesses of PVC Plastic available. 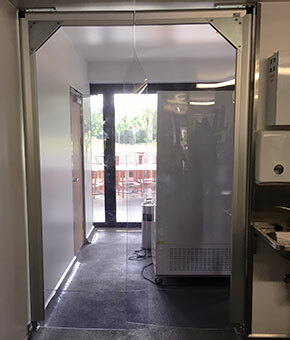 5 mm thick plastic sheet per personnel traffic making the door more economical and more light weight allowing them to open with a light push of the hand. 7 mm thick plastic sheet for doors subjected to trolleys, ladders or tables on wheels etc. 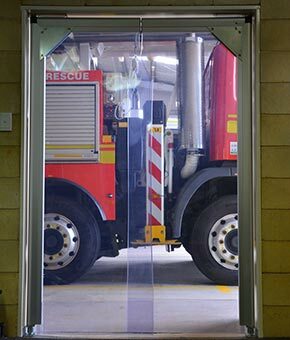 This 7 mm thick plastic can take the punishment and makes the doors the safest solution as they absorb impact reducing the risk of injury significantly. 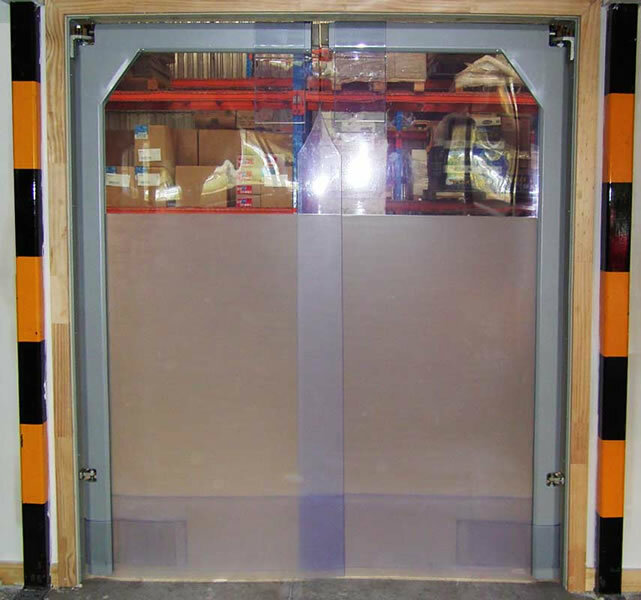 Austcold Industries’ medium-duty aluminium swing doors come pre-tensioned before despatch. Tension can be adjusted by following the procedure described in the installation instructions. A grub screw, easily adjusted using a (3 mm) allen key, can be turned to align the door with the lintel. The door height can be adjusted by rotating the adjustment nut located on the bottom pivot. Countersunk holes are located on the galvanised bottom mounting plate, to provide universal mounting options. A Magnetic lock-open accessory is available, which is secured to the door jamb. 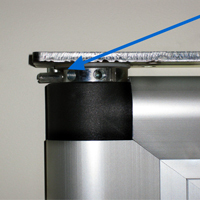 A powerful neodymium magnet conveniently secures the door at 90°. 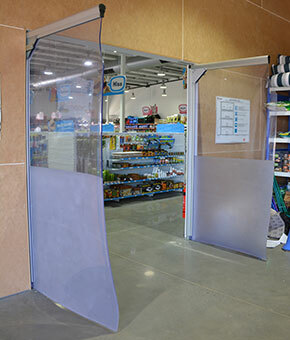 Opaque Panels – Swing Door Panels can be opaque up to a specified height, this provides a frosted appearance to the plastic sheet for privacy. The aluminium door frames can be powder coated in a variety of colours for applications which require colour matching or resistance against corrosion. Dulux standard powder coat range is available. Our Medium Duty Swing Doors have a self-returning mechanism incorporated into the top hinge, it is secured into the horizontal lintel section of the door way. The door’s lower hinge is located at the floor; it can be secured into the vertical of the door jamb or Dyna-Bolted to the floor. Door Frame – The door frame consists of an aluminium extrusion which is clear anodized. PVC Panels – Our PVC Panels for Swing Doors are 5mm (Pedestrian only) or 7mm (For trolleys etc) in thickness. 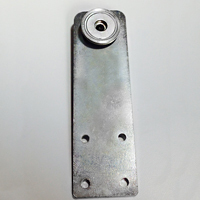 Top Hinge – Is an electroplated steel plate 50mm wide x 250mm long with 4x countersunk holes. 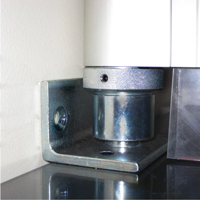 Bottom Hinge – Is an angle plate 90mm wide located at the bottom with countersunk holes for securing. Features and Options – Click on the Features Tab to view features and options. Gussets – One aluminium gusset and one steel gusset provides a receiver for the (optional) magnetic lock open feature. Check the construction, soundness and levelness of the door frame / jamb. If the door opening is not square, you may have to pack out either the top hinge mount or the bottom pivot mount. Secure the bottom pivot hinge into place. * The bottom pivot, nut and mount angle must be in place before the top hinge mount can be fixed. Hold the door in position and open the door slightly (it may be necessary to relieve the tension) while keeping the top hinge mount straight. Secure the fasteners for the Top Hinge. Drill Holes at 4mm to accommodate 14 gauge countersunk wood screw. Use 8mm countersunk cap screws, drill a 6.8mm hole and tap using an 8mm x 1.25mm tap. Use 8mm countersunk cap screws, drill a 6.8mm hole and tap using a 8mm x 1.25mm tap. 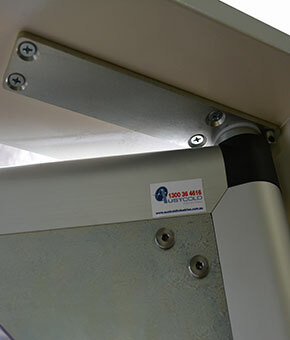 – Adjust the bottom pivot locking nut, up until it sits firmly against the aluminium swing door frame. – Tighten the grub screw of the locking nut. Austcold Industries’ medium duty aluminium swing doors come pre-tensioned before dispatch. 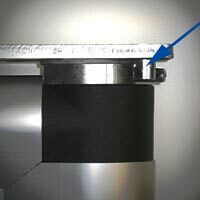 If the door requires more or less tension, insert a; 6mm dia. Steel rod / dowel into the torque adjustment holes. Remove the stop pin using a straight-tip screwdriver, while ensuring that you hold the tension on when removing the pin. Increase or decrease the spring tension gradually, by one hole or as required. Re-insert the stop pin. The door can be aligned/centralised by inserting an allen key into the grub screw located at the rear of the hinge assembly. Either increase or decrease the grub screw.